Barron County Sheriff Chris Fitzgerald speaks during a news conference about 13-year-old Jayme Closs who has been missing since her parents were found dead in their home in Barron, Wisconsin, Oct. 17, 2018. The northwest Wisconsin girl who went missing in October after her parents were killed has been found alive, authorities said Thursday. 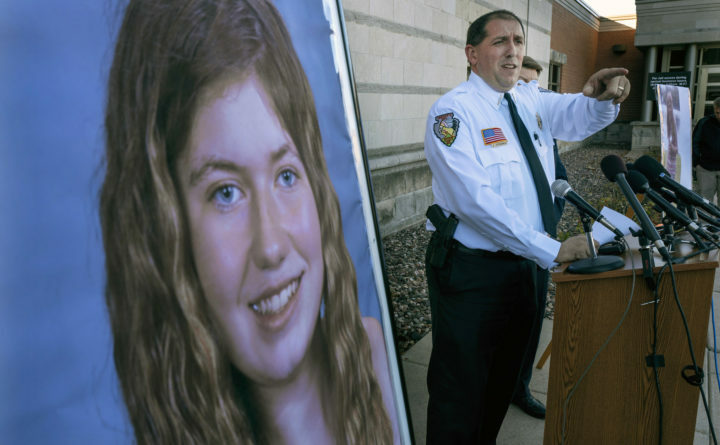 BARRON, Wisconsin — The grandfather of a 13-year-old northwestern Wisconsin girl says she’s in “exceptionally good spirits” after being found nearly three months after authorities say she was kidnapped during a home invasion that left her parents dead. Jamye Closs had been missing for nearly three months when she approached a stranger Thursday near the small town of Gordon. Officers arrested 21-year-old Jake Thomas Patterson minutes later based on Jayme’s description of his vehicle.